In this article we'll show you how to create a Scheduler and implement server-side integration based on Ruby on Rails framework and REST API. 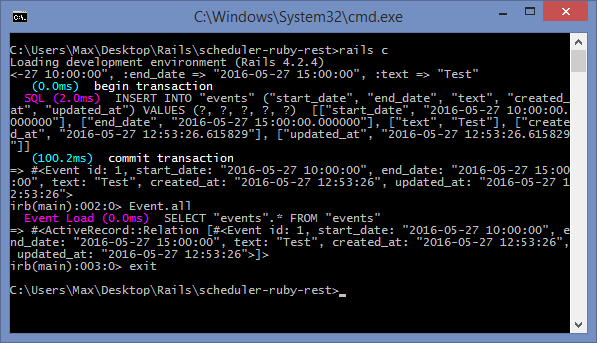 If you have Ruby on Rails installed, you can begin to implement the integration at once. Otherwise, you should install the framework by following the steps described in the installation guide. Once everything is ready, you can start completing the integration step by step. Now you need to add a controller that will process users' request to the server through the application. Since requests differ in their type, you need to separate controllers for certain requests. To define the connection between a controller and the type of request, routing will be used. Different routes can be served by different actions. The actions collect information which will be passed to the view. Let's create a new controller with the name "home" and a new action called "index". The output should confirm that new files were created. post "data(/:id)", :to => "event#add"
put "data/:id", :to => "event#update"
delete "data/:id", :to => "event#delete"
So the server is ready and you can proceed with views adding. To begin with, you should download the dhtmlxScheduler package. from the package to the directory vendor/assets/stylesheets/ of your project. Now you are ready to create a view. Views will visualize the information gathered by actions. 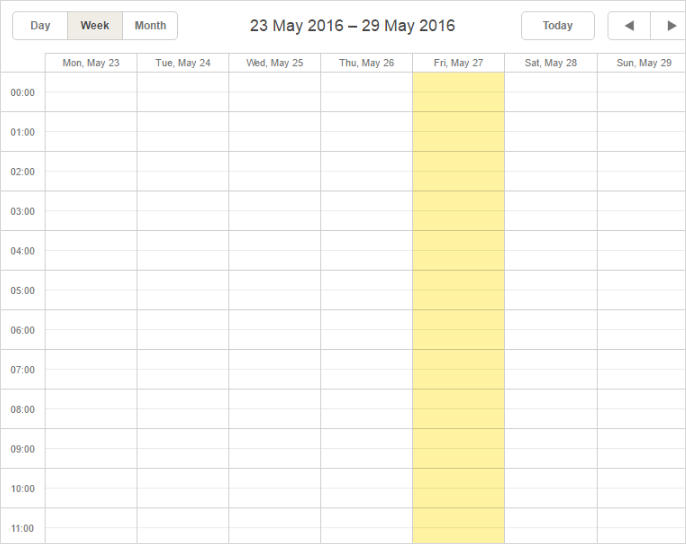 Thus you've got a scheduler where you can add events and modify them. But it lacks the saving ability. To provide it, you need to proceed with creating models. Since Scheduler operates events entities, you need to add a model for them. You can find the list of mandatory properties of the Event object with their descriptions in the corresponding article of documentation. 4 . Enter "exit" to close the console. Next you need to implement data loading and saving in the scheduler with the help of controllers. There's a common technique for loading data into Scheduler from the server side. You will find the requirements to the client side, as well as the description of possible requests and responses in the Server-Side Integration article. Below you will fine the info on how to load data into Scheduler using Ruby on Rails server side. 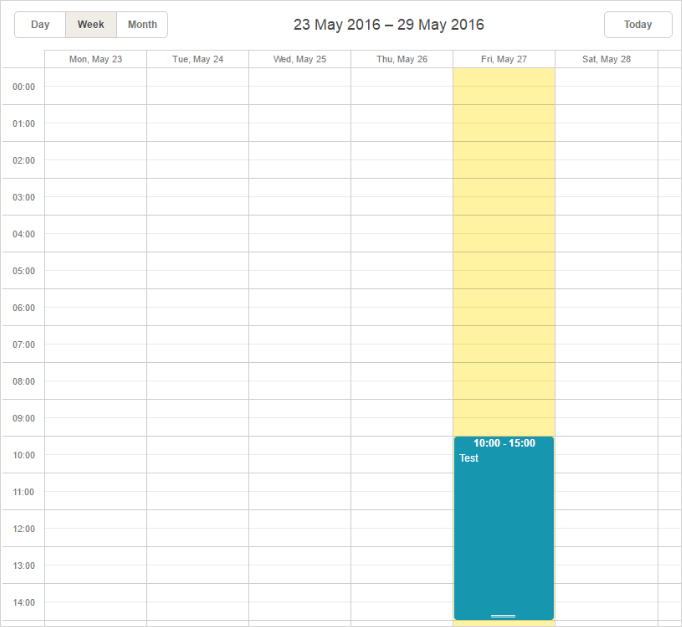 It will make an object with data for a Gantt chart and will contain a list of events. The dates of events should be converted into appropriate strings. All actions return a JSON response containing the type of the performed operation or "error" if something went wrong. Note that a response for the "insert" action also contains a database id of the new record. It will be applied on the client side, so the new item could be mapped to the database entity. The last thing you have to do is to put the following code into the <script></script> part of the app/views/home/index.html.erb file. It initializes Scheduler and enables it to load and save data. That's all. Now you can run the application in a browser and see the result. As you can see, an event appeared in the scheduler. You have added it at the Step 6. Now you can add more events and modify them. All the changes will be saved in the database. – event_length (a real length of a series of events). Remove the events table from the database or remove db/development.sqlite3. After that open config/initializers/assets.rb and add the dhtmlxscheduler_recurring extension to the precompile array. Next open views/layouts/application.html.erb and include the dhtmlxscheduler_recurring.js extension. If you've precisely followed the given instructions, you should now have a ready-to-use scheduler with recurring events that perfectly works with Rails framework. In case you've completed the above steps to implement Scheduler integration with Ruby on Rails, but Scheduler doesn't render events on a page, have a look at the Troubleshooting Backend Integration Issues article. It describes the ways of identifying the roots of the problems.